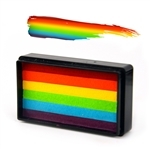 Art Factory Body Art & Party Place: New Face Painting Products! To all our glitter tattoo friends who also paint faces, we have great news, we have added new face paint products to make you happy! This is a new Australian brand of face paint which is highly pigmented. Everyone who tries it is impressed with the beautiful colors. Our friends at Kapital Kidvention LOVED the global magenta, the dark blue and all of the pearl colors. The solids are great for blending and line work! The metallic and pearls are shimmery and work great for blending and bases. Don't forget about the awesome neon global paints for black light parties! You are really going to want to try these paints. These glitter gels are amazing and HUGE! The bottles are 36 mL are do not need an extra tip. They add that extra detail and sparkle to all your paintings. The only problem you will have with these glitter gels is deciding which color you want to try first! If you have never tried an Arty Cake, now is your chance! These one stroke cakes have an array of colors in each stroke which will make your painting super quick and beautiful. Use them to make your butterflies, monsters, and princesses even more special! We are going to continue to products for face painting. If you have ideas, requests or suggestions, please let us know!